Suitable for mopping up oils and spills, and in manufacturing workshops and automotive garages as a good general workshop rag. CHARGE AHEAD WITH RHINO RAGS! TIDDOX is one of Australia's top suppliers of quality bags of rags, leading the charge with their 10kg and 5kg COLOURED T-SHIRT RAGS called "RHINO RAGS" supplied to businesses nationwide. The toughest, softest rag on the market! Why do businesses love TIDDOX's RHINO RAGS ? It's a combination of outstanding product quality, affordable price and excellent service, that keep our customers returning. 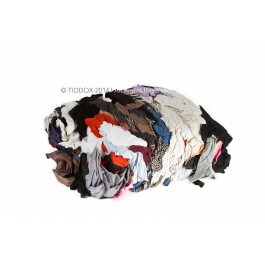 TIDDOX COLOURED T-SHIRT RAGS are recycled from old reclaimed t-shirts that were otherwise headed for landfill. The coloured T-shirt fabrics have been carefully separated from the other cotton materials and then washed clean to sanitise them from any contaminants so that they are hygienic for reuse as workshop rags. Using giant laundromats, the recycled T-Shirts are laundered to remove any unpleasant smells and contaminants that might be on the discarded fabrics, making them hygienic and fit for reuse. A key component to ensuring that the end product is safe from potentially harmful objects is to run the rags through a metal detector to identify and remove foreign objects, pins, zips and buttons that may remain on the T-Shirts. Without such a quality controlled process, potentially harmful metal objects could remain in the rags and cause harm to the user of the rag or scratch or damage the surface being wiped with the rag. This is particularly important to CAR CARE and AUTOMOTIVE industry users of our rags, who rely on these soft cottons to wash, dry and polish vehicle and boat surfaces. Recycled cotton T-Shirts are softer and more absorbent than newly manufactured cotton T-Shirts. Absorbency increases further still depending on the quality of the selected T-Shirt materials - i.e. the lower the polyester fabric and higher the cotton content, the higher the absorbency of the rags. With these principles in mind, TIDDOX's rags prove to be excellent absorbers of inks, paints and solvents which makes them popular with PAINTERS and PRINTERS. INDUSTRIAL businesses like them because not only are they great absorbers of solvents and chemicals, they are also pretty handy to wipe off grease and oil from machinery, tools and equipment. COLOURED T-SHIRT RAG material is a low linting fabric, so ideal for wiping tasks such as polishing vehicles, wiping down equipment, and certain painting and printing applications and some industrial cleaning jobs where it is important not to leave lint on the surface after wiping. TIDDOX COLOURED T-SHIRT RAGS are available in 10kg bags and 5kg bags, which are convenient sized portable bags, easy to carry, transport, freight and store. In terms of wiping solutions, one would struggle to beat TIDDOX's value for money offering provided by its COLOURED TSHIRT BAGS OF RAGS , a relatively economical way to buy a bulk bag of quality disposable recycled rags, that can be used for multipurpose cleaning from polishing to drying to soaking up just about anything. Other related products from TIDDOX 's range of cleaning rags, wipes and cloths include the WHITE T-SHIRT RAGS, the LOW LINT INDUSTRO WIPES and the SOLVENT RESISTANT WIPES.